At J.O. Mory we go where the job takes us. 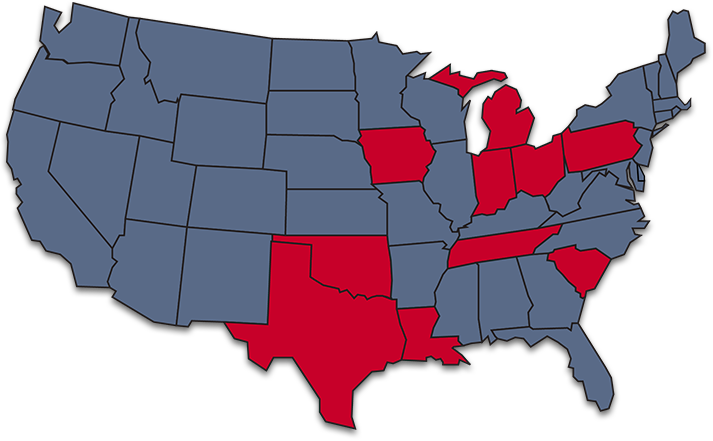 While our primary service area is the tri-state region of Indiana, Michigan, and Ohio, we are also licensed in Louisiana, South Carolina, Tennessee, Texas, Oklahoma, Iowa, and Pennsylvania. Our team of qualified installation and service technicians, along with our in-house engineering department, design systems that fit your needs. Many of our field technicians and fabrication workers are cross-trained to ensure your business the best solutions with accurate, on-time delivery. The benefits are clear: greater efficiency and comfort with better service and savings than other companies can offer. If your company has a need for high-end electrical service, plumbing and process piping, HVAC and mechanical systems, or state-of-the-art fire protection, we are confident we can handle the job, regardless of the size and scope of the project. We go where our work takes us.